Hooray! We finally gathered five light curve data points as part of our ongoing Algol eclipse study. You will recall that several of the recent posts have outlined the nature of the Algol eclipse and of our various attempts to prepare and gather data. Well finally, it all came together; or at least we have five data points just as the light from Algol went from normal magnitude to just about eclipse minima. Some of the details of collecting this data and analysis tools will now be discussed. Remember that the observing plan was to start about 4-5 hours before the eclipse minima and take images about every hour until 4 hours after the minima. This way we should be able to see Algol at maximum brightness and then watch it decrease in magnitude and then rebound over these 10 hours or so, until it is again at maximum brightness. In actuality I was clouded out initially and finally made first of the eclipse measurements at 10:07 on January 24. A previous measurement on January 23 was used as a baseline nominal, non-eclipsed magnitude. Each of these five measurements look much like the image shown below, which covers an area of 11 degrees by 16.5 degrees. This image has been conveniently annotated with the names Algol, the target star, and Mirphak, the reference star. 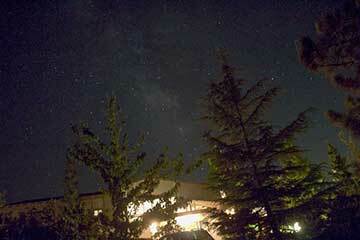 How does one know that these little points of light are those particular stars? 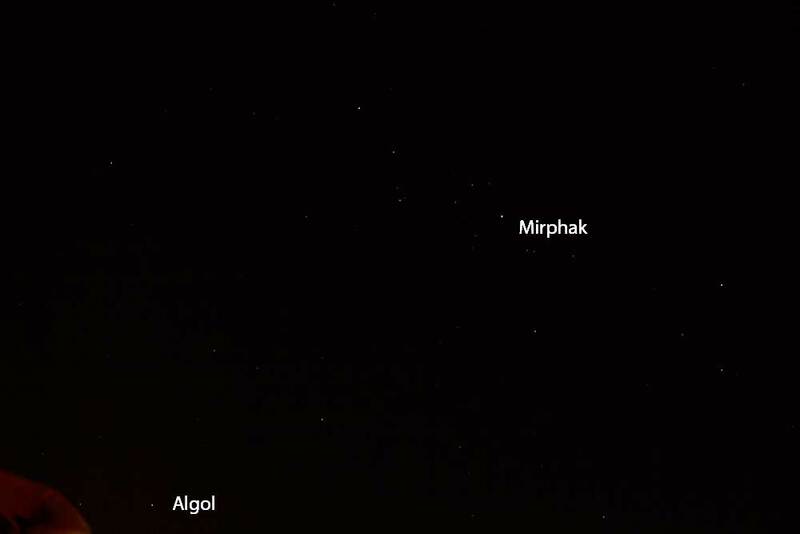 Remember, I am just pointing my camera at Algol, based on where my judgment, based on looking at star charts on my IPhone app, as to which of these stars is Algol and Mirphak. 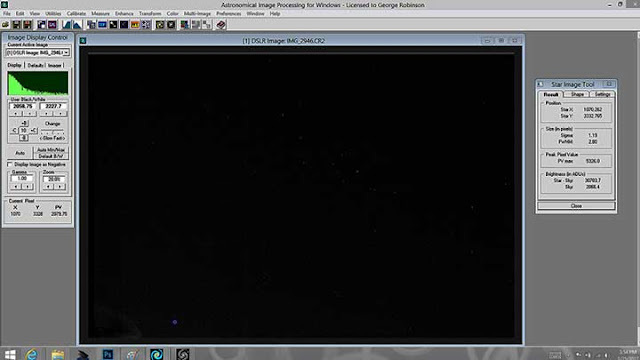 To make sure that my assumed pointing direction is correct, the above image, and the other images, are uploaded to Astrometry.net, where the analysis software compares the image to star charts for the whole sky and then by overlaying the observed stars on top of catalog stars and moving and shifting the images around and scaling the images, determines the location which best matches the image. The screenshot of this analysis is shown below. The coordinates of the image center are found to be RA = 03 22 53 and Dec = 47 31 15 and the catalog position of Algol is RA = 03 08 10 and Dec = 40 57 20, so we find that Algol is in the camera frame. When I first did this comparison, I thought the errors between coordinates and the catalog didn't work, but then when you realize that RA and Dec run not up and down on the image, but diagonal, then the errors are still put Algol in the frame. 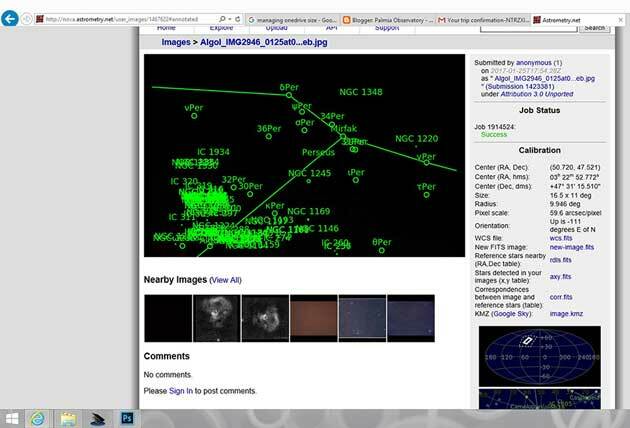 A second analysis tool is shown in the Megastar chart screenshot below where the 75mm camera image is identified as the white rectangle. To find Algol on this chart, I just clicked on the bright star in the lower left of the frame and, hooray, the coordinates of that star are indeed those for Algol as seen in the small windows at the left side of the screenshot. It turns out that Mirphak is the bright dot with the white circle around it. 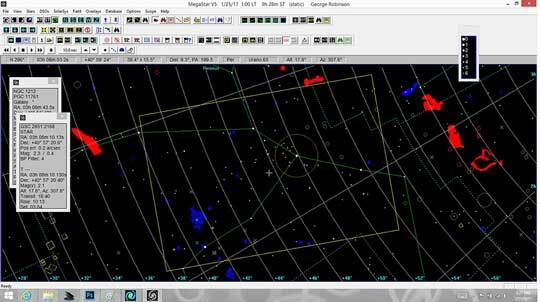 The number of stars visible in the screenshot depends on the range of allowable magnitudes, which in this case is set to magnitude = 6 and brighter. Now knowing the locations of Algol and Mirphak, the star image tool in AIP4WIN is used to measure the amount of light associated with each star. The tool just draws a little annulus around the target star and adds up all of the light in all of the pixels in that annulus and then subtracts the amount of background sky light in a much wider annulus around that same star. Now, we do the same type of analysis for all five available images and collect and plot the raw values of light coming from Algol and Mirphak. See below. The first data points plotted at hour 8 come from the reference image taken a day before the remaining four data points and I just arbitrarily chose to assign the hour 8 to that data point and the four data points actually leading up to the eclipse minima then are plotted at the actual hour for which they were generated. So, what do we notice in this first plot of the raw data? well, the brightness of Mirphak seems to be mostly constant until the last data point taken at 1:04 AM on January 25. The data points for Algol show a steady decrease in brightness as the evening goes on. But there is not data for any time after 1:04. Why is that you ask? Well, I was really tired and cold and had pretty much stayed awake as much as I could, but to my defense, I should mention that that last image was just 18 degrees above the horizon and getting low in the sky and the clouds were starting to come back. So, even if I had wanted to take a couple more data points, I was going to run out of observability due to houses, trees and clouds. Darn! I just could not collect the other side of the eclipse light curves. Now those of you who have done some light curve analysis will know that just plotting the raw DSLR ADU pixel counts is just the beginning of the analysis. At least two other corrections to the raw data should be made in order to get a more definitive answer as to what the actual light output from Algol was during this period. First, the amateur should compensate for the vignetting that always occurs for the lens being used. This effect usually results in objects located in the center of the lens to show up as being brighter than the same object if it just happened to be found near the edge of the lens. I did not compensate for this effect. The second correction that should be done is to compensate for the amount of extinction of light due to the different amount of Earth's atmosphere through which the photons travelled on their way to the camera. Objects photographed high overhead will experience the least amount of atmospheric attenuation and objects near the horizon will suffer the most attenuation. We can start to see this effect in the last data point in the plot because that data point was collected at just 18 degrees above the horizon. So there is more work to be done to analyze the light curve. After applying these and other corrections, the raw data counts can be converted to magnitudes. It's a lot of work and I'm not sure if I want to follow up on all of that work, but time will tell. I hope you can get a sense of what is involved in collecting and analyzing light curves from stars and then eventually tying that data back to real processes that must be happening at the star. In this case, Algol, is an eclipsing binary star system. For other stars, they vary in magnitude because of internal instabilities, often which are caused in such a way that the variation in magnitude is periodic and predictable. Using stars of these types has formed the basis of establishing distance scales to other stars and galaxies. It's pretty neat how science of observing stars from here on Earth leads to an understanding of what is going on at the star. So, that is it for this post. This has been a first attempt at light curve analysis of an eclipsing binary. I am busy packing my bags and will be flying in the morning to DC for the APS April meeting.